Home / Technology / Where Does NY Garbage Go? Where Does NY Garbage Go? BROOKLYN, NY— The population of our planet is growing, as are the piles of garbage that humanity is producing. But where does all this garbage go? It turns out that in New York City, trash is not a total nuisance - it can also be useful and sometimes even profitable. New York’s population is almost 8.5 million people. And every day, every resident literally leaves behind a pile a garbage. Where does much of that trash go? To the Sims Municipal Recycling Facility in Brooklyn, which features the latest technology in garbage processing. Every month, the facility processes 20,000 tons of metal, plastic and glass. The city’s recycling program encourages New Yorkers to sort bottles and cans into separate bags. City garbage collection services bring the bags here. But only about 20 percent of New Yorkers sort their garbage for recycling. Sims General Manager Tom Outerbridge says that's because of the city's diverse population and high turnover. “All of these create challenges for recycling programs that you may not have in a more suburban homogenous society. But given those challenges, the city does quite well," said Outerbridge. 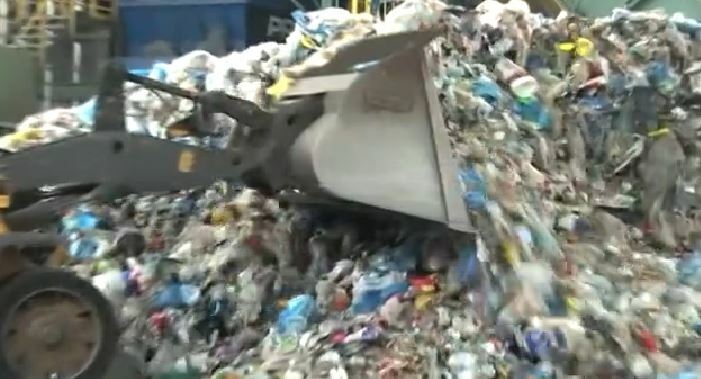 This machine, called “Liberator," rips plastic bags apart and sends the contents to be sorted.. A huge magnet pulls out items that have iron in them and diverts them to a separate conveyor. And this piece of equipment breaks glass that “floats” in another direction. "Ballistic separators have panels inside that are moving like this. Two dimensional things get walked up the panels, like paper, plastic bags, when three dimensional things, like bottles and cans, get rolled down the panels," said Eadaoin Quinn. Optic scanners, which cost about $100,000, are the most technologically-advanced part of the process. They are programmed to identify certain types of objects, like plastic water and milk bottles. When the scanner “sees” one, it signals dozens of air fountains on the conveyor belt, to blow it onto a separate conveyor. "We are working with materials that everybody says is garbage, but it’s recyclable things," said Marcus. Sorted garbage arrives at the baler, which produces the facility's final product – pressed bales of plastic and metal, each weighing up to half a ton. Sims Recycling sells the bales to industrial plants where new bottles and cans are made for New Yorkers to use again. "We are just making the Earth a better place. We are helping each other survive. I think that’s the best part," said Monica. Sims also sets an example by its own environmental consciousness. It has solar panels on the roof and a wind turbine right in front of the entrance. Together, they provide up to 20 percent of the energy needed for the plant's operations.